The suitcase is packed, the oven is shut off, the lights are dimmed, and I’m off to Hong Kong! It’s been quite a flurry of Christmas card writing and holiday baking, and I’m looking forward to a little rest and relaxation halfway across the world. I’ve got a few posts tucked away, though, so do check back here in the next week or so for some more of my holiday treats. And in the meantime, I’ve got an early holiday gift for all my wonderful Dessert First readers: 15% off your purchase from Charles Chocolates! The Candied Hazelnut Bar, which combines sweet candied hazelnuts in a 65% bittersweet chocolate – crunchy, smooth, and delectable. The Tea Collection, truffles infused with Asian teas ranging from robust to floral to fruity – some of the best infused chocolates I’ve encountered. The Wine Infused Pâte de Fruit – I am seriously addicted to these sweet little hemispheres of wine. With Gewurtraminer, Merlot, Sauvignon Blanc, Cabernet Sauvignon, and Champagne, they’re a heady, delightful treat. 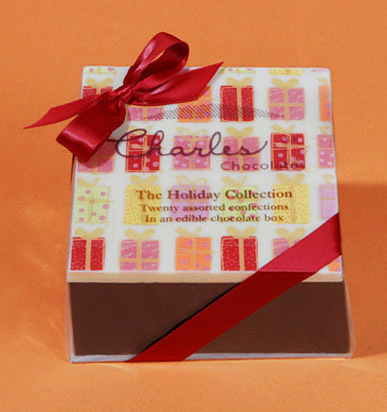 The Holiday Collection – Charles Chocolates’ signature edible chocolate box with a cute holiday design. What better gift than one where the box can be eaten? 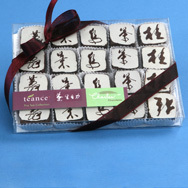 Mini Chocolate Squares – For your chocolate fix on the go, convenient little five gram squares of indulgence. 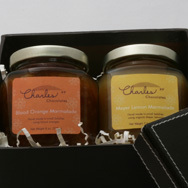 Artisan Marmalades – The blood orange and Meyer lemon marmalades made in-house for Charles’ filled truffles became so popular that now they’re canned and sold on their own! Perfect for breakfast or teatime. 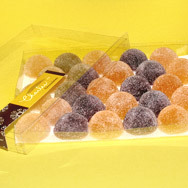 Be sure to visit Charles Chocolates’ site to see the rest of their lineup. To take advantage of this offer, simply go to Charles Chocolates’ site to place your order. Then type in the promo code DESSERTFIRST when you check out. This offer is good through December 17th. Don’t forget, you also have a chance to win one of Charles Chocolates fabulous new Boxed Assortments, filled with caramels, truffles, and chocolates, in the Menu for Hope campaign. Check it out here. Happy holidays to all my dear readers – I hope you enjoy this little gift! i love charles chocolates’ tea collection, but i gotta try some of the other items as well. anyway, have a wonderful time in hong kong … too bad i won’t be back this x’mas or else we could do a lil’ dessert tour together >__<. happy holidays, anita! Have a wonderful time Anita!! Have fun in Hong Kong! I may be headed there in April, so let me know of any “must do”s!! Have so much fun on your trip…while I have fun drooling over Charles Chocolates! Bon Voyage! I wish I can come along ;’( HK is a wonderful place for foodies so I know you will have a blast! oh, have fun and enjoy your holiday in Hong Kong!